Come and sea what all the fuss is about ~ you won't be disappointed! Castaway Cottage welcomes couples and small family groups to experience a little slice of seaside heaven. The timber-lined cottage is cosy, simple and open-plan with combined kitchen and dining. Cooking facilities include bench top 2 element/oven, a baby Webber BBQ, New fridge/freezer, Double (cosy) bed on the ground level. A serene seaside escape where you will relax, unwind and rejuvenate your spirit. 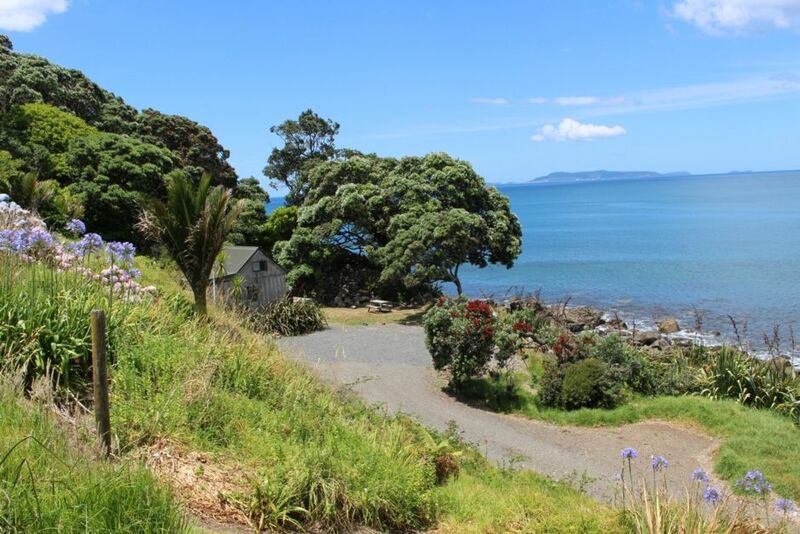 Privately located on a coastal farm and surrounded by Pohutukawa trees with ocean waves crashing against the rocky foreshore just metres away. Incredible ocean views south over to Kuaotunu and Matarangi coastline and east to Great Mercury Island. If you are fortunate you will spot the dolphins or whales just offshore. The rocky seashore invites snorkelling, fishing, sea- kayaking or beachcombing for treasures. Day trips can be comfortably taken from Castaway Cottage to explore further north - Little Bay, Waikawau Beach (surf beach) or visit Colville, Port Charles, Stony Bay. Tuateawa is located approximately 30 minute drive from Coromandel Town - the last stop for petrol and provisions. Off the beaten track, this coastal area has a spectacular rocky coastline with high cliffs and rocky foreshore and fabulous flora and fauna - a true nature lover's paradise. Beautiful white sand beaches are located south at Kennedy Bay (6 kms) or north 10 kms to Little Bay and Waikawau. PLEASE NOTE: There are no shops or restaurants in Tuateawa. Coromandel Town is the last stop for petrol and provisions. Waikawau DOC Camp Store open for basics. Approx.15 minutes drive North. The kitchen has a large modern fridge with 2 shelf freezer compartment so good food storage for 3-4 days. Cooking facilities include: Mircowave, small electric bench oven with 2 elements, a Webber BBQ with gas supplied and a large frying pan. The kitchen is equipped with crockery, pans, pots, cups, glasses etc and basic pantry items. *Peak rates apply to all public and school holidays. NO DOGS - The area is a KIWI protected zone. At Coromandel Accommodation we have a wonderful selection of holiday homes available for rental. Whether you want the bush, the beach, a one room bach on the waterfront or be closer to town, we can assist you with your accommodation choices to stay in and around the Coromandel Town area and the beautiful unspoilt area of northern Coromandel. We are passionate about our area and like to ensure that guests receive our local knowledge and recommendations on the best of everything to experience here. We look forward to hosting you in one of our many serviced holiday homes and apartments. Perfect waterfront retreat for couples or small family groups. An ideal base to stay, unwind, relax, recharge and explore the natural beauty of the Northern Coromandel, green native forests, pristine beaches, hiking tracks! New (2018) upright fridge/freezer with good storage capacity for 3-4 days of fresh food. 2 compartment freezer. Front lawn, leading onto the rocks and foreshore. Beautiful natives trees & flaxes. Absolutely breath taking. I’m already planning to go back. Such a secluded beautiful place to stay. Super romantic too! Top spot for wave watching - almost nothing between us and the ocean. Comfy cottage-clean and cosy. Highly recommended for a quiet retreat. We didn't want to leave. It was absolutely unbelievable and some of the best times I have ever had. It is even more beautiful in real life. Looved the short stay we had there. Birds and lots of time to sit and watch the waves, which were rather large and loud on the rocks. Just what we needed, fell asleep outside under the shade of the natural surrounding bush. Close to local beach and bush walks. Wish i could sit and watch that view everyday. Fantastic location great being so close to the ocean. We had a very enjoyable stay. Places like this are becoming very rare - a true Kiwi bach in a superb position overlooking the water. It is well worth the drive over the gravel roads to get there . Little Bay beach must not be missed. Castaway Cottage is located approximately 35 min (21.5 km) via Kennedy Bay Rd from Coromandel Town the main service center for the Northern Coromandel - There are no shops or restaurants in Tuateawa. Please note the roads are narrow, winding, some sealed and unsealed parts. Care should be taken. All local services and businesses are located in the lovely heritage town of Coromandel.